Elevated selenium concentrations in streams are a water-quality concern in western Colorado. 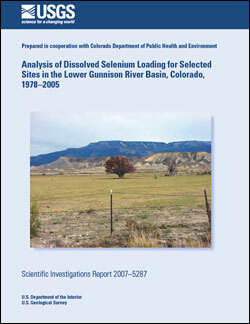 The U.S. Geologic Survey, in cooperation with the Colorado Department of Public Health and Environment, summarized selenium loading in the Lower Gunnison River Basin to support the development of total maximum daily selenium loads at sites that represent the cumulative contribution to U.S. Environmental Protection Agency 303(d) list segments. Analysis of selenium loading included quantifying loads and determining the amount of load that would need to be reduced to bring the site into compliance, referred to as "the load reduction," with the State chronic aquatic-life standard for dissolved selenium [85th percentile selenium concentration not to exceed 4.6 μg/L (micrograms per liter)], referred to as "the water-quality standard." Streamflow and selenium concentration data for 54 historical water-quality/water-quantity monitoring sites were compiled from U.S. Geological Survey and Colorado Department of Public Health and Environment data sources. Three methods were used for analysis of selenium concentration data to address the variable data density among sites. Mean annual selenium loads were determined for only 10 of the 54 sites due to data availability limitations. Twenty-two sites had 85th percentile selenium concentrations that exceeded the water-quality standard, 3 sites had 85th percentile selenium concentrations less than the State standard, and 29 sites could not be evaluated with respect to 85th percentile selenium concentration (sample count less than 5). To bring selenium concentrations into compliance with the water-quality standard, more than 80 percent of the mean annual selenium load would need to be reduced at Red Rock Canyon, Dry Cedar Creek, Cedar Creek, Loutzenhizer Arroyo, Sunflower Drain, and Whitewater Creek. More than 50 percent of the mean annual load would need to be reduced at Dry Creek to bring the site into compliance with the water-quality standard. The Uncompahgre River, Gunnison River at Delta, and Gunnison River near Grand Junction would require 69, 34 and 53 percent, respectively, of the mean annual load to be reduced for water years 2001 through 2005 to meet the water-quality standard. Mean annual load reductions can be further reduced by targeting the periods of time when selenium would be removed from streams by remediation. During a previous study of selenium loads in the Lower Gunnison River Basin, mean annual load reductions were estimated at the Gunnison River near Grand Junction for the 1997–2001 study period. Mean annual load reductions estimated for this study period were less than those estimated for the 2001–05 study period, emphasizing the importance of understanding that different study periods can result in different load reduction estimates. Thomas, J.C., Leib, K.J., Mayo, J.W., 2008, Analysis of dissolved selenium loading for selected sites in the Lower Gunnison River Basin, Colorado, 1978–2005: Reston, VA, U.S. Geological Survey Scientific Investigations Report 2007–5287, 25 p.